The term rhythm and blues has undergone a number of shifts in meaning. In the early 1950s it was frequently applied to blues records. Starting in the mid-1950s, after this style of music contributed to the development of rock and roll, the term "R&B" became used to refer to music styles that developed from and incorporated electric blues, as well as gospel and soul music. 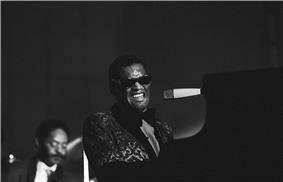 By the 1970s, rhythm and blues was used as a blanket term for soul and funk. In the 1980s, a newer style of R&B developed, becoming known as "Contemporary R&B". It combines elements of rhythm and blues, soul, funk, pop, hip hop and dance. Contemporary R&B vocalists include Michael Jackson, Stevie Wonder, Whitney Houston, and Mariah Carey. New Orleans producer-bandleader Dave Bartholomew first employed this figure (as a saxophone-section riff) on his own 1949 disc "Country Boy" and subsequently helped make it the most over-used rhythmic pattern in 1950s rock ‘n’ roll. 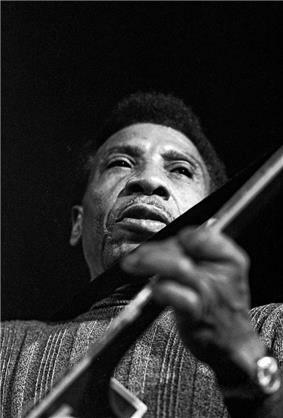 On numerous recordings by Fats Domino, Little Richard and others, Bartholomew assigned this repeating three-note pattern not just to the string bass, but also to electric guitars and even baritone sax, making for a very heavy bottom. He recalls first hearing the figure – as a bass pattern on a Cuban disc" (1995). "I heard the bass playing that part on a 'rumba' record. On 'Country Boy' I had my bass and drums playing a straight swing rhythm and wrote out that 'rumba' bass part for the saxes to play on top of the swing rhythm. Later, especially after rock ‘n’ roll came along, I made the 'rumba' bass part heavier and heavier. I’d have the string bass, an electric guitar and a baritone all in unison." Gerhard Kubik notes that with the exception of New Orleans, early blues lacked complex polyrhythms, and there was a "very specific absence of asymmetric time-line patterns (key patterns) in virtually all early-twentieth-century African American music . . . only in some New Orleans generes does a hint of simple time line patterns occasionally appear in the form of transient so-called 'stomp' patterns or stop-time chorus. These do not function in the same way as African time lines." In the late 1940s this changed somewhat when the two-celled time line structure was brought into the blues. New Orleans musicians such as Bartholomew and Longhair incorporated Cuban instruments, as well as the clave pattern and related two-celled figures in songs such as "Carnival Day," (Bartholomew 1949) and "Mardi Gras In New Orleans" (Longhair 1949). While some of these early experiments were awkward fusions, the Afro-Cuban elements were eventually integrated fully into the New Orleans sound. Robert Palmer reports that, in the 1940s, Professor Longhair listened to and played with musicians from the islands and "fell under the spell of Perez Prado's mambo records." He was especially enamored with Afro-Cuban music. Michael Campbell states: "Professor Longhair’s influence was . . . far reaching. In several of his early recordings, Professor Longhair blended Afro-Cuban rhythms with rhythm and blues. 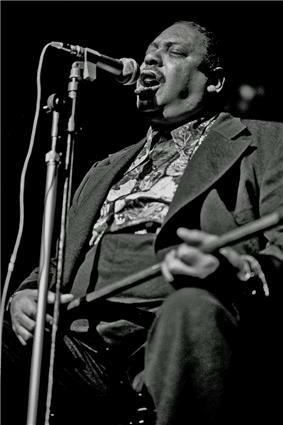 The most explicit is 'Longhair’s Blues Rhumba,' where he overlays a straightforward blues with a clave rhythm." Longhair's particular style was known locally as rumba-boogie. In his "Mardi Gras in New Orleans," the pianist employs the 2–3 clave onbeat/offbeat motif in a rumba boogie "guajeo" (below). 2–3 clave is written above the piano excerpt for reference. Saxophone guajeo in blues progression. "Mambo Boogie" by Johnny Otis (1951). The "Bo Diddley beat" (1955) is perhaps the first true fusion of 3-2 clave and R&B/rock 'n' roll. 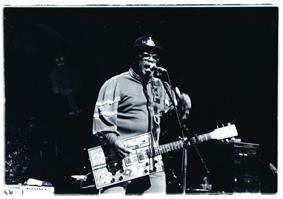 Watch: "Hey Bo Diddley" performed live by Bo Diddley (1965). on YouTube Bo Diddley has given different accounts of the riff's origins. Sublette asserts: "In the context of the time, and especially those maracas [heard on the record], 'Bo Diddley' has to be understood as a Latin-tinged record. A rejected cut recorded at the same session was titled only 'Rhumba' on the track sheets." Johnny Otis' "Willie and the Hand Jive" (1958) is another example of this successful blend of 3–2 clave and R&B. .The Johnny Otis ShowWatch: "Hand Jive" performed by Johnny Otis. on YouTube Otis used the Cuban instruments claves and maracas on the song. Ruth Brown on the Atlantic label, placed hits in the top 5 every year from 1951 through 1954: "Teardrops from My Eyes", "Five, Ten, Fifteen Hours", "(Mama) He Treats Your Daughter Mean" and "What a Dream". Faye Adams's "Shake a Hand" made it to #2 in 1952. In 1953, the R&B record-buying public made Willie Mae Thornton's original recording of Leiber and Stoller's "Hound Dog" the #3 hit that year. Ruth Brown was very prominent among female R&B stars. Ruth Brown’s popularity most likely derived because of “her deeply rooted vocal delivery in African American tradition”  That same year The Orioles, a doo-wop group, had the #4 hit of the year with "Crying in the Chapel". British rhythm and blues developed in the early 1960s, largely as a response to the recordings of American artists, often brought over by The Kinks. Although this "purist" interest in the blues would have an impact on major British rock musicians, including Eric Clapton, Jeff Beck, Peter Green and Jimmy Page, other artists adopted an interest in a wider range of rhythm and blues styles. Most successful were the Rolling Stones, whose first Zoot Money. Bands to emerge from other major British cities included The Animals from Newcastle on Tyne, The Moody Blues and Spencer Davis Group from Birmingham, and Them from Belfast. None of these bands played exclusively rhythm and blues, but it remained at the core of their early albums. The British Mod subculture was musically centred on rhythm and blues and later soul music, performed by artists that were not available in small London clubs around which the scene was based. As a result a number of bands emerged to fill this gap, including Small Faces, The Creation, and most successfully The Who. The Who's early promotional material tagged them as producing "maximum rhythm and blues", but by about 1966 they moved from attempting to emulate American R&B to producing songs that reflected the Mod lifestyle. Many of these bands enjoyed national success in the UK, but found it difficult to break into the American market. The British R&B bands produced music which was very different in tone from that of African American artists, often with more emphasis on guitars and sometimes with greater energy. 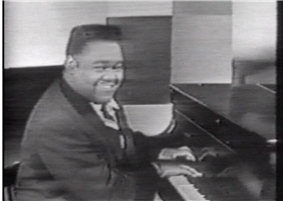 They have been criticised for exploiting the massive catalogue of African American music, but it has also been noted that they both popularised that music, bringing it to British, world and in some cases American audiences, and helping to build the reputation of existing and past rhythm and blues artists. Most of these bands rapidly moved on from recording and performing American standards to writing and recording their own music, often leaving their R&B roots behind. Many helped pioneer psychedelic, and eventually progressive and hard rock, having a major influence of the nature and sound of rock music and meaning that rhythm and blues would be a major component of that sound. ^ a b "R&B". Kustom Beats. Retrieved July 13, 2012. ^ a b Frere-Jones, Sasha (April 3, 2006). "On Top: Mariah Carey's record-breaking career". ^ Jarret, Michael (October 6, 1998). "Whitney Houston Syndrome". Sound Tracks: A Musical ABC. ^ "'Vision of Love' sets off melisma trend". ^ "The 100 Greatest Singer of All Time : Rolling Stone". ^ Sacks, Leo (August 29, 1993). "The Soul of Jerry Wexler". New York Times. Retrieved January 11, 2007. ^ a b c d e Cohn, Lawrence; Aldin, Mary Katherine; Bastin, Bruce (September 1993). Nothing but the Blues: The Music and the Musicians. Abbeville Press. p. 314. ^ Rye, Howard. "Rhythm and Blues". Oxford Music Online. Retrieved 20 July 2014. ^ a b "Tad Richards, "Rhythm and Blues", St. James Encyclopedia of Pop Culture". Findarticles.com. January 29, 2002. Retrieved April 20, 2012. ^ "Hot R&B/Hip-Hop Songs 1947". 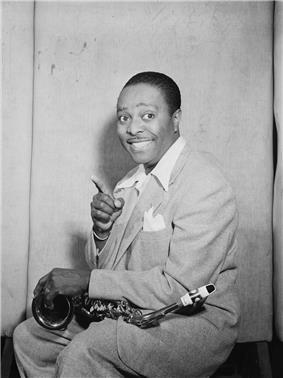 ^ "Louis Jordan at All About Jazz". Allaboutjazz.com. Retrieved January 7, 2010. ^ "Hot R&B/Hip-Hop Songs 1948". ^ "– Year End Charts – Year-end Singles – Hot R&B/Hip-Hop Songs". Billboard.com. Retrieved April 20, 2012. ^ Morton, “Jelly Roll” (1938: Library of Congress Recording): "Now in one of my earliest tunes, 'New Orleans Blues,' you can notice the Spanish tinge. In fact, if you can’t manage to put tinges of Spanish in your tunes, you will never be able to get the right seasoning, I call it, for jazz." The Complete Recordings By Alan Lomax. ^ Dave Bartholomew quoted by Palmer, Robert (1988: 27) “The Cuban Connection” Spin Magazine Nov.
^ Boggs, Vernon (1993: 30–31). "Johnny Otis R&B/Mambo Pioneer" Latin Beat Magazine. v. 3 n. 9. Nov.
^ Stewart, Alexander (2000: 307). "Funky Drummer: New Orleans, James Brown and the Rhythmic Transformation of American Popular Music." Popular Music, v. 19, n. 3. Oct. 2000, p. 293-318. ^ a b Sublette, Ned (2007: 83). ^ Peñalosa, David (2010: 174). The Clave Matrix; Afro-Cuban Rhythm: Its Principles and African Origins. Redway, CA: Bembe Inc. ISBN 1-886502-80-3. ^ Roberts, John Storm (1999: 136).The Latin Tinge. Oxford University Press. ^ Sublette, Ned (2007: 69). ^ a b "– Biography – Johnny Otis". Billboard.com. Retrieved April 20, 2012. ^ "Kevin Smith Librarry : Case Western Reserve University : Search Results : Mintz". Library.case.ueu. Retrieved May 21, 2014. ^ "Hot R&B/Hip-Hop Songs 1953". ^ "Hot R&B/Hip-Hop Songs 1957". ^ "Information Not Found". Billboard.com. Retrieved January 7, 2010. ^ "Hot R&B/Hip-Hop Songs 1959". ^ "Hot R&B/Hip-Hop Songs 1960". ^ """Sample of "Gee Whiz. Music.barnesandnoble.com. Retrieved May 21, 2014. ^ "The Beginning". Web.fccj.edu. Retrieved January 7, 2010.